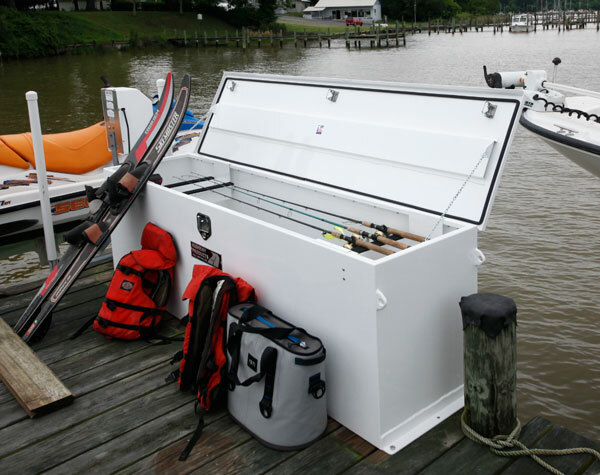 Looking for a Boat Dock Box that will outlast your dock! Made from Aluminum! No Plastic! No Fiberglass! 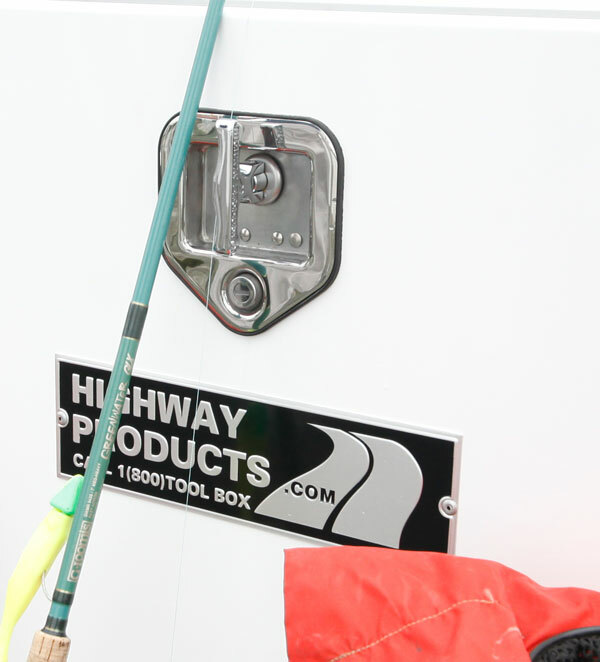 Highway Products builds them using 1/8th inch thick Marine Grade Aluminum, Stainless Steel Semi Truck tough Locks, bullet proof continuous hinge, and a rugged Powder-Coat finish! 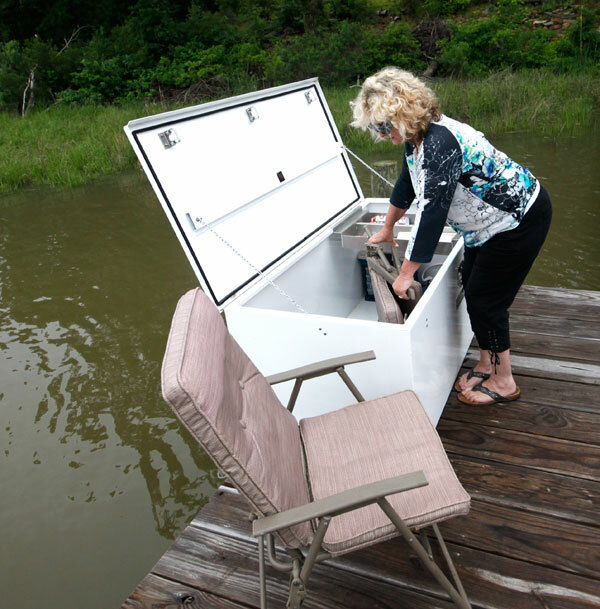 Many sizes to choose from or ask for a special size to fit your boat dock. Got a special feature you need? No problem. We do this every day. 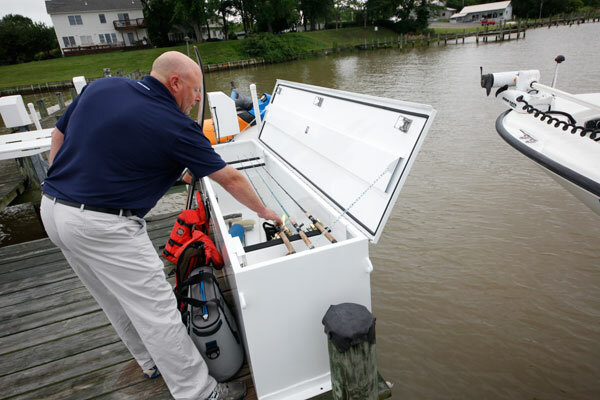 Patrick is loading up his new rod locker dock box built to his specifications. He got what works for him. You can too! 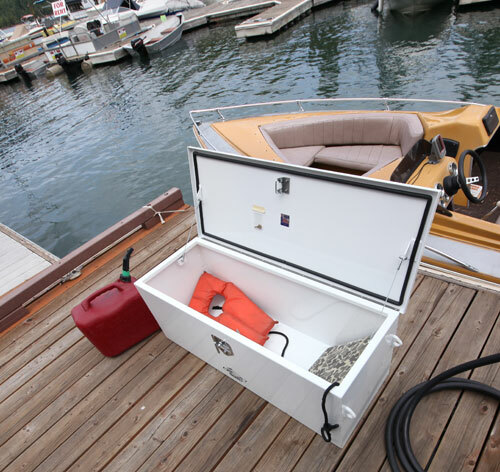 #1 Storage: Keep your needed items close to the boat so you don't have to pack them down to the boat dock every time you want to go for a ride. 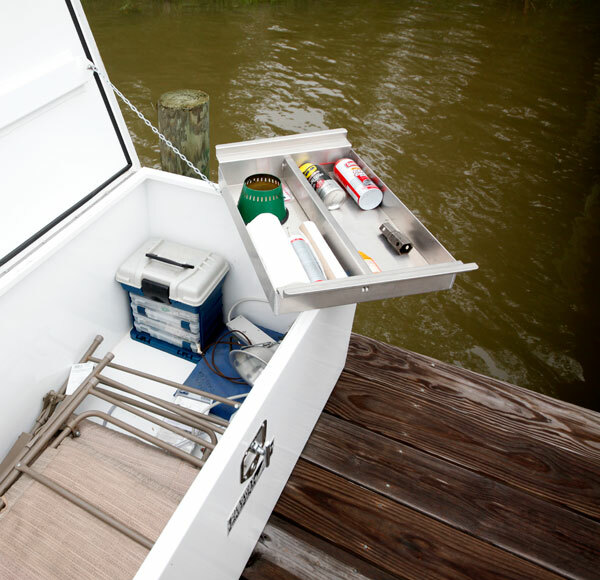 Note: We recommend you lay out all the items to keep in your dock box and measure as best you can the size you'll need. Lawn chairs might be the biggest item you stow. So make a list and check it twice! 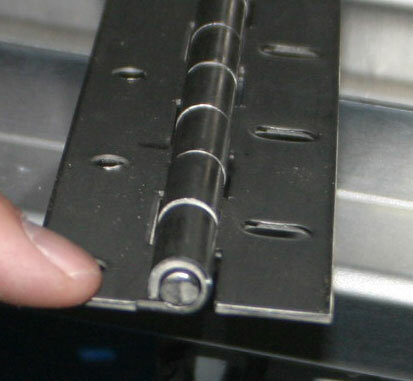 #2 Security: We've used these same stainless steel Tee-locks since 1980 on our semi-truck tool and storage boxes. They've held up to the riggers of salted roads and abuse only truckers can give. 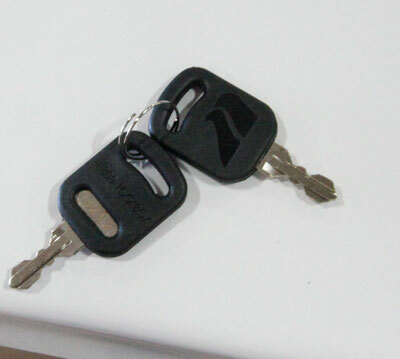 Below you'll see our keys are the double-cut style for extra security and will work either way you put them in. (No fumbling with keys in the dark) Beside it shows our three point lock system. 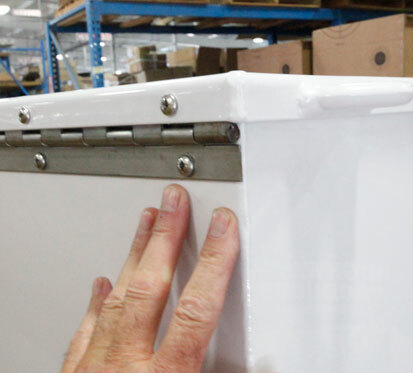 Note: We determine which lock system works best at the factory by the size of dock box. 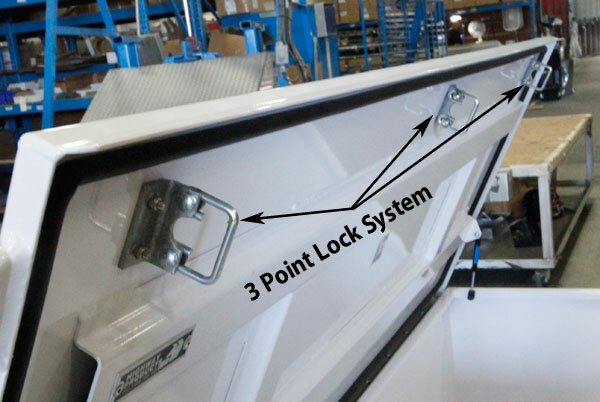 Single, double, or three point lock system. Locking hasps for pad locks available too. 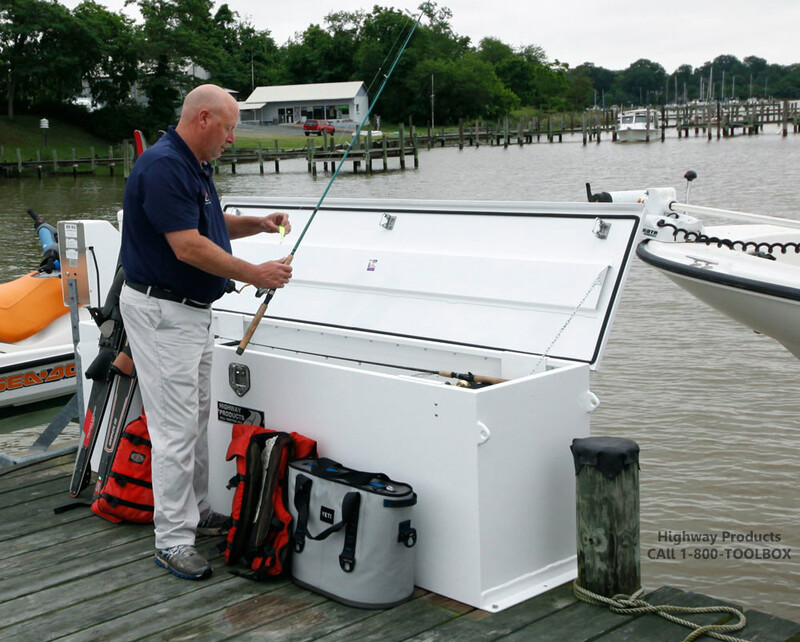 #3 Weather tight: The over-hang style flange on our dock box lids is probably the oldest style of box or chest there is. 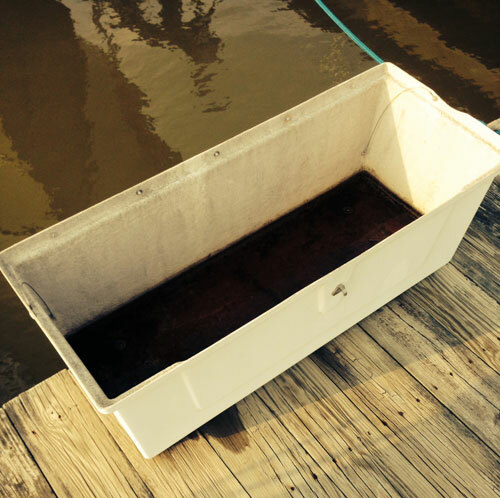 This simple design is ideal for dock boxes and has stood the tests of many storms. Add our automotive grade weather striping and you have a seal you can count on to keep you valuables dry and last for many years. 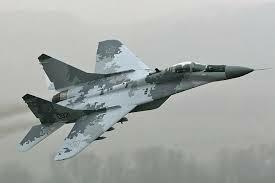 #4 Made of Aluminum: This is one of the strongest strength to weight materials ever made. 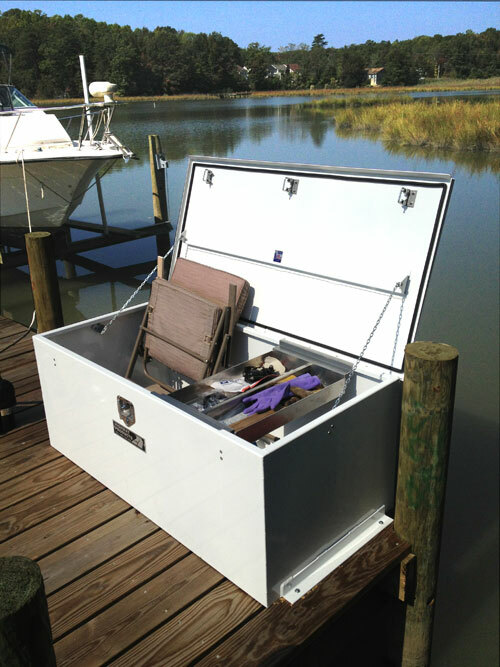 We use a generous 1/8th inch thick aluminum in a 5052H32 marine grade alloy that resists salt and will last for a hundred years. Airplanes, cars, boats, trucks, trailers are just a few products aluminum works best for. 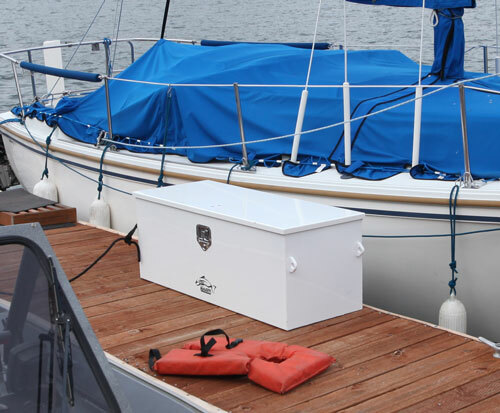 Our dock boxes are also light weight so you could easily unbolt and carry them to high ground before a hurricane carries your boat dock away. 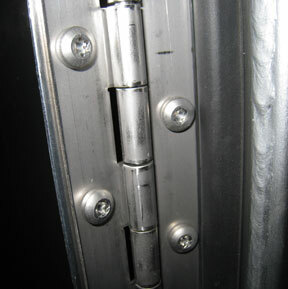 #5 Stainless Steel Continuous Hinge: If there's one place we overkill, it's the hinge. How often have you seen a box or chest with a failed hinge. Not here, it's the hinge. 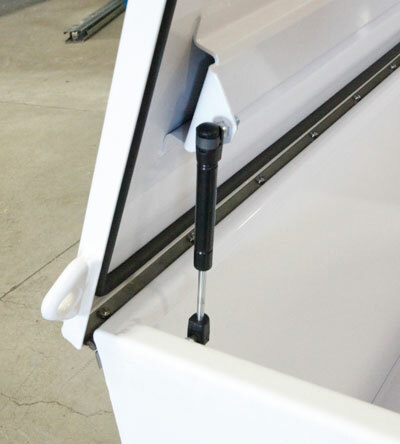 We use a full length 304 stainless steel hinge that will never rust or let you down. #6 Stainless Steel Fasteners: You've seen boxes of all kinds still in good shape except the rivets have popped off. We use 1/4 inch stainless steel screws you can bet on. #7 Powder Coat: We've all owned products with powder coatings and already know they are tough. 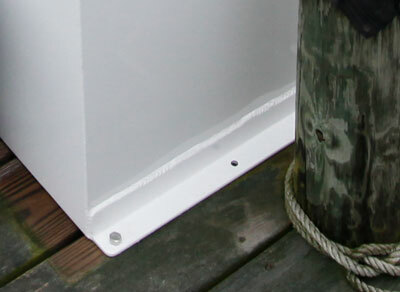 Powder coat is a baked on finish that seeps into the pores of the aluminum and bonds at 400 degrees F. This smooth but rugged coating looks good on your boat dock and adds even more protection to the the aluminum, and resists stains . 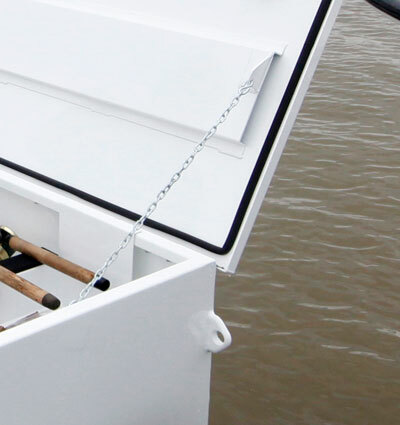 #8 Tote trays: We put these handy aluminum trays in almost every dock box we make. They're great for small items you use down at the boat dock like suntan lotion, wax, soap, cleaning materials, bug spray, and tools. Plus, you can carry them around. 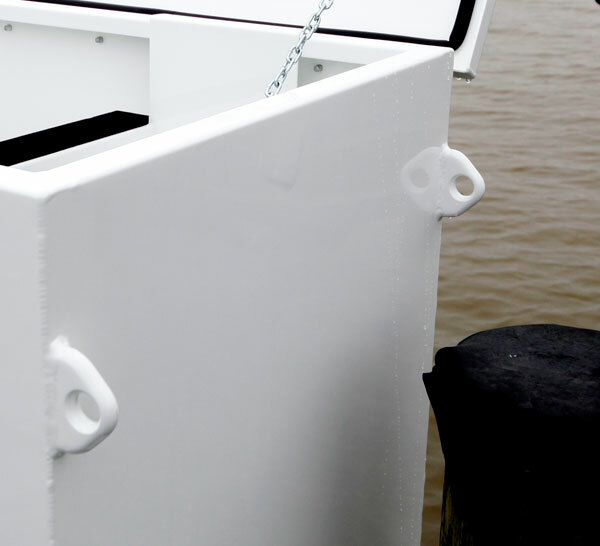 #10 Mounting System: We weld a 1/4 inch reinforced aluminum mounting bracket to the sides of our dock boxes to ensure a strong and water-tight mount. #11 Door Props: We give you a choice of chains or gas charged door props for your dock box. The advantage of chains is the door opening is bigger, easier to get your cargo out, and chains last forever. However, a gust of wind may blow the door closed at times. The gas charged door props are great for wind as they just flex a little, then return to the open position. Plus, being charged with inert gas, they assist in opening the lid. Nice for the bigger boxes but aluminum is very lightweight and even the bigger lids are not hard to open. Gas springs don't last forever, ten years is average. Not a problem though. Our lifetime warranty covers them! So all you do is call us for an new one. We like the gas props ourselves. #12 Lifetime Simple "We've Got Your Back" Warranty: We have a simple warranty that says, if your product fails due to our fault, we fix or replace it. You don't need a receipt and you're not required to register our product. We just take care of it! 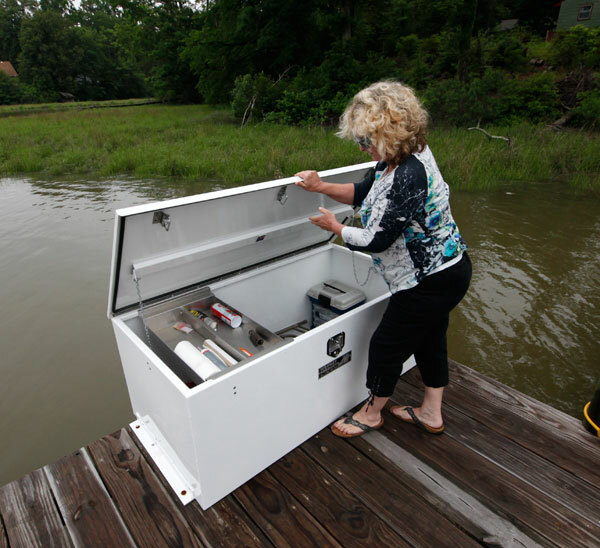 Considering a custom size or custom features built in just for you and your boat dock? We will gladly customize to your spec and send you a preliminary print to look at, maybe make changes, and sign off on before we build it. Free of charge! 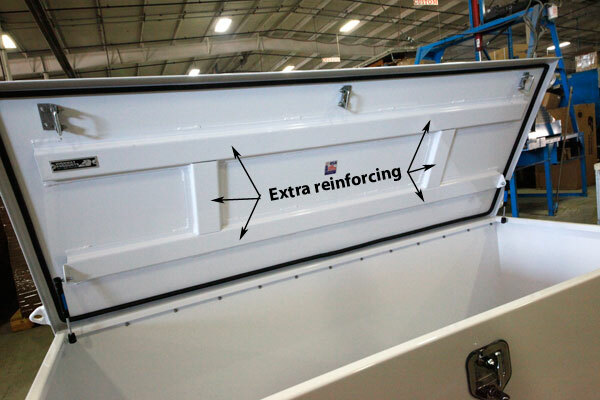 Fiberglass and plastic are built on molds - can't be changed. 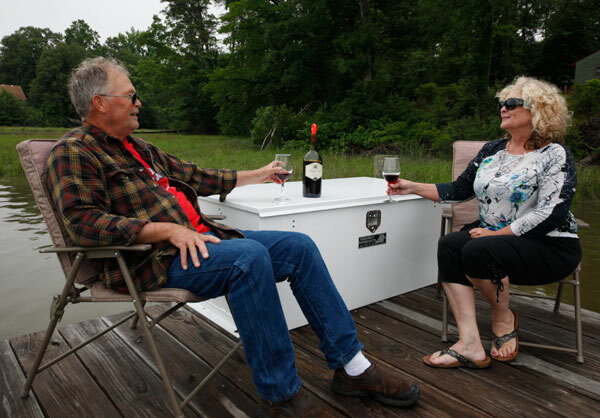 We've even seen them filled with ice and used as a giant cooler. 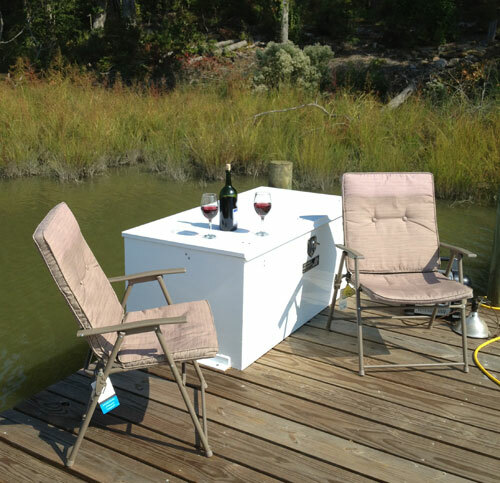 At 24" tall, this dock box makes for a nice table. 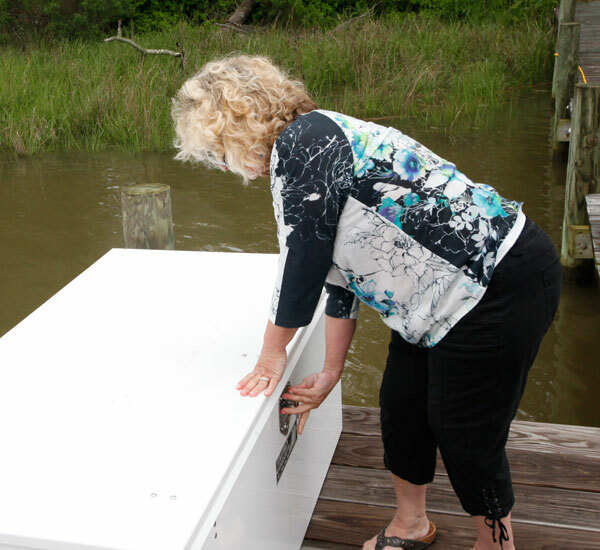 Lightweight aluminum makes opening a large dock box a cinch. Debby locking up for the night. 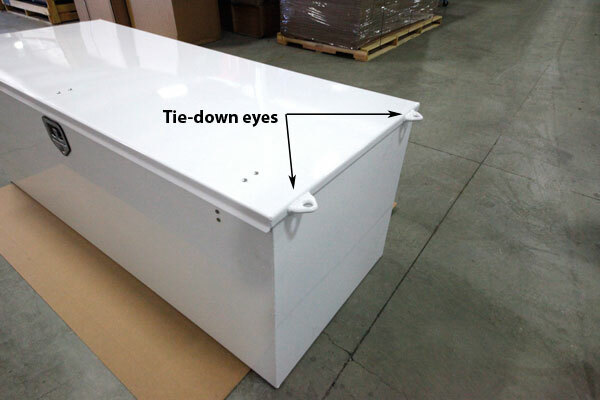 This customer requested us to weld our tie-down eyes on the lid so he could have a place to strap a seat pad. He also asked us to add reinforcing to the lid bottom. No problem. 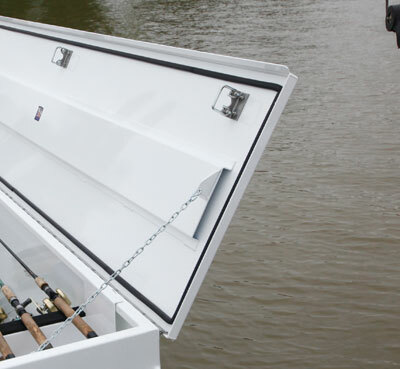 Aluminum bow eyes welded to all four corners give you another place to tie up your boat or use a cable lock and secure your bicycle to the box. Remember us talking about the failed hinge. Highway Products dock boxes don't have this problem. 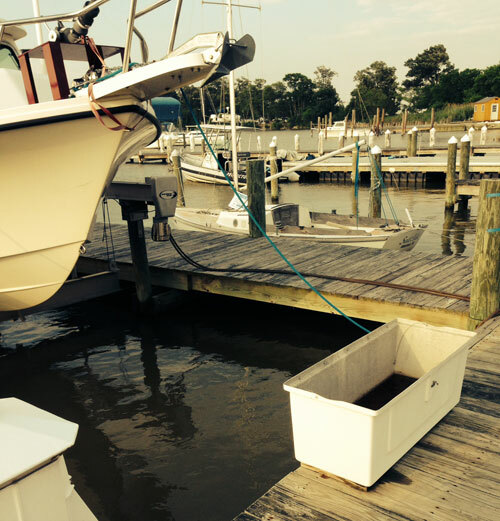 Plastic and fiberglass dock boxes just don't hold up.